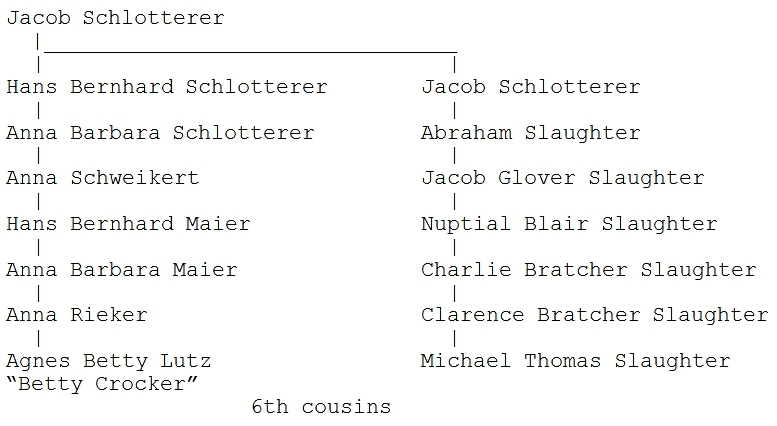 I have been working on my book on the Slaughter family, writing about all the descendants of Jacob Schlotterer. He was born in Bodelshausen, Germany in 1693 and died in Germantown, PA in 1769. Jacob came to America in 1749 with two sons, three daughters, and the husbands of two daughters. The third daughter seems to have died somewhere along the journey, as she doesn’t appear in the church records in Germantown with the rest of the family. Jacob’s oldest son, Hans Bernhard Schlotterer, stayed behind in Bodelshausen with his wife and children. I have a town family book for Bodelshausen, which compiles all the records of births, deaths, and marriages from the beginning back in the 1500s up to the early 1900s. I have just finished researching and entering into my book all the descendants of Hans Bernhard Schlotterer. For a number of his descendants, the record book has notations that they went to America or married in America. For each of these, I have researched American records and have identified most of them and traced their descendants. After doing this, I started entering everyone from my book into Family Tree Maker, and checking the people I had already entered previously. This week I came upon one of Hans Bernhard’s descendants that had a different note from the usual. This note was for Anna Rieker and said that she was born 7-27-1881 in Bodelshausen and had died in September 1976 in Princeton, NJ. So I had to stop entering my book into the genealogy software and research this new puzzle. I had entered Anna into my database, so I hit the button to do an Ancestry.com search. The first thing I found was the Social Security Death Index which showed her birth date and the September 1976 death date. It gave her last name as Lutz. So I entered her husband as “unknown Lutz” and hit the search again. This time, it came up with a link to her entry on findagrave.com. This page gave her name as Anne Riker Lutz and gave her death date as 9-19-1976. The middle name further confirmed that I had found the correct individual, and I now had her exact death date. 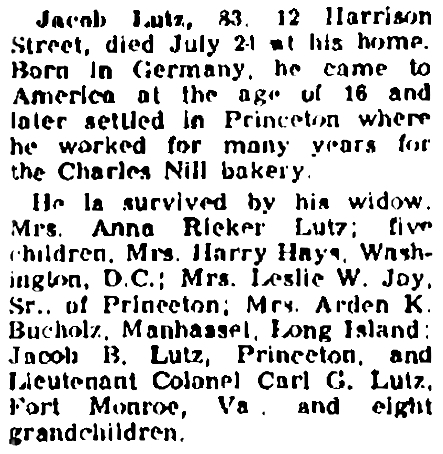 Other items in the search results gave me her husband’s name, Jacob Lutz, his age, and the names and ages of her children. The census records gave me Jacob’s approximate birth year and the year of his immigration from Germany. 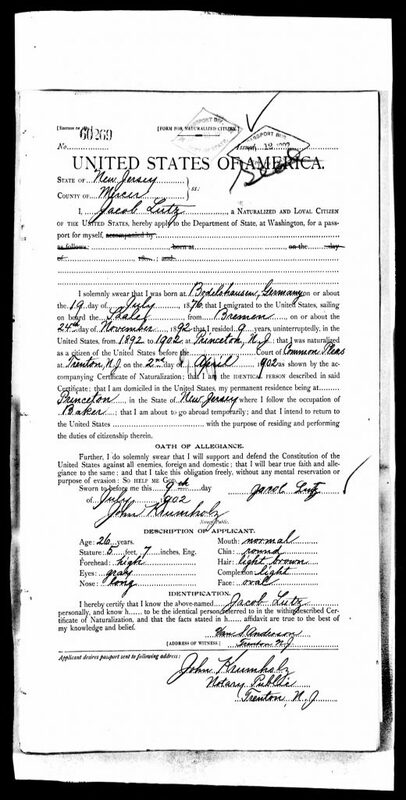 When I hit the search button for him, I found a passport application he had filled out 7-9-1902. That application gave his exact birth date, 7-19-1876, and gave his birth place as Bodelshausen. It also gave the date that he emigrated from Germany, 11-24-1892. Since he was born in Bodelshausen, I was able to find him in the town family book and get his parents’ names, Hans Jakob Lutz and Agnes Nill. An interesting thing I noticed about the passport application is that it was dated in 1902. I knew that date had shown up before, and I found that it was the year that Anna Rieker came to America, according to the census records. So my guess is that Jacob Lutz went back to Germany to get Anna and bring her back with him. A little over a year later, their first child, Agnes Betty Lutz was born. 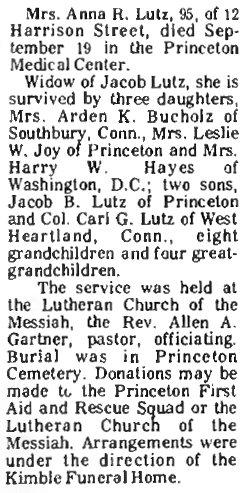 Armed with all the dates and names, I did further research and found newspaper obituaries for Jacob and Anna. These gave the daughters’ husbands names. The obituaries didn’t say which husband was married to which daughter, so I had to research those. The first husband I researched was Arden K. Bucholz, mainly because it was an unusual name and should be easy to find. I found many references, including a number concerning his work in the radio business. One thing that puzzled me at first, was the fact that his wife’s name was listed as Betty in almost everything. I knew, based on her age, that she had to be Jacob and Anna’s daughter, Agnes. I kept searching and finally found a marriage announcement from 1929 that referred to her as Agnes B. Lutz. So Betty was her middle name, and she dropped the Agnes. The 1940 census records said that Arden was a representative for a radio station and that Betty was an artist in the radio business. The marriage announcement said that she was Betty Crocker on the radio. I also found a newspaper article that explained her role. It seems that originally there was one local Betty Crocker cooking show sponsored by General Mills. It was successful, so they expanded the concept to other stations around the country. They never announced that Betty Crocker was played by an actress, so the public thought she was a real person. When multiple stations had their own shows, sometimes people could receive two different stations that had different Betty Crockers. They would write in saying that one station or the other was airing an imposter. General Mills decided that wouldn’t do, so NBC started a network version of the show, initially through 16 stations, and contracted Betty Lutz to play Betty Crocker. She married Arden K. Bucholz and became Betty L. Bucholz. 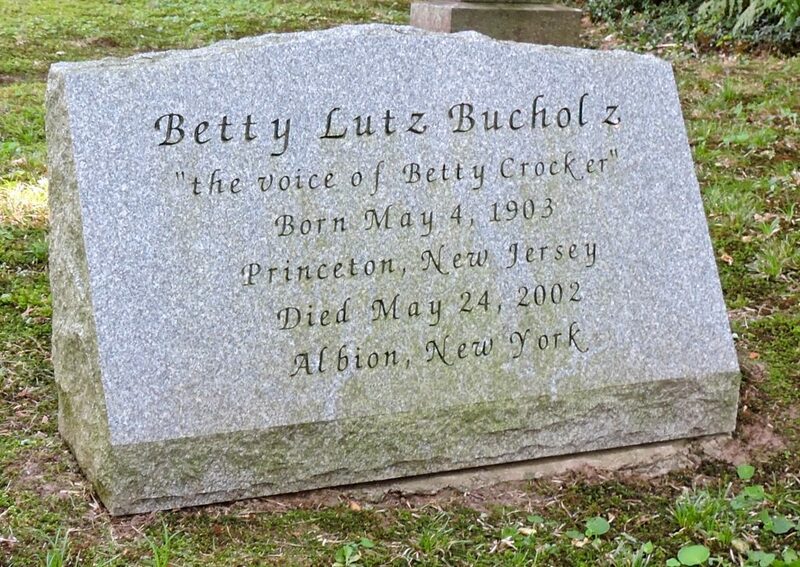 She played Betty Crocker on NBC until the early 1940s. Hugh Downs was her announcer part of the time. Another actress later played the part for television. Here is a chart showing how I am related to Agnes Betty Lutz Bucholz. So Betty Crocker is my 6th cousin. "A Place for My Stuff"